Running errands is very different when kids are involved! Taking your child with to you to run errands can be a bit challenging. From taking extra time getting them ready to leave the house to managing distractions in the store, shopping with little ones can add more stress to your trip. Next time you’re running errands, try these tips to make the experience more fun for your child and less stressful for you! Work around their schedule. Let’s be honest, most adults aren’t at their best when they’re hungry or tired, and the same is true for children! It’s best to work errands around your child’s eating and sleep schedule, not the other way around. Make sure kids have had their regular meal or a snack before heading out on errands with you. Sticking to their sleep schedule helps as well. 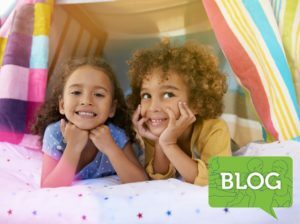 While it might be tempting to squeeze in a quick trip to the grocery store or dry cleaners before naptime, this tends to be when meltdowns happen. Save your errands for after their naptime or early the next morning for a smoother trip! Shop at off-peak times whenever possible. Who needs a big crowd to add more stress to an outing? Try to avoid running errands during busy times, such as right after work or on weekend afternoons, if possible. 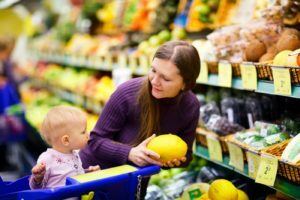 By finding a time when the store isn’t crowded, you’ll be able to navigate the aisles more easily and kids are able to walk with you if they don’t want to sit in the cart. Explain things up front. Before leaving for errands, explain what you’ll be doing that day. Tell them how long you think the errands will take, if you’re going to the grocery store what foods you will get, where you’re going, and what to expect. Remind them ahead of time that you’ll bring snacks and water in the car and that they will have lunch when you both get home. Make errands educational. Turn grocery shopping into a math lesson when you let your little one count each piece of fruit as they put it in the bag. Older kids can work on subtraction too! Say, “We need 5 apples and 3 are in the bag. How many more should we pick out?” Talk with kids about the foods you want them to get. You can play “I Spy” with them while they search for the food. Kids can also compare prices by reading the price stickers on different brands and, when they’re older, determine how much something costs per unit. Give them a job. Kids love to help you! Give them a simple job, like carrying empty reusable bags at the grocery store or holding an envelope or box you have to mail while you wait in line at the post office, to involve them in your errands. You can also have them seated in the cart while looking for items and pointing them out to mom. Some grocery stores have small carts that kids can push themselves. Pushing a kids cart works best for kids over the age of three and if mom feels comfortable letting them do so. By 24 months, children should be able to follow two-step directions such as “pick up the cereal box from the shelf and put it in the basket.” Asking for help in this way can help keep little ones busy. If you have only a few items to purchase at a store with a self-checkout machine, have your little one play cashier and scan a few of the items while you scan the rest. They’ll enjoy playing a part in helping you check items off your to-do list. Remember your little one just loves spending time with you. They’ll love doing “big kid” things by helping you complete your errands and check items off your to do list! Kids stuck inside? These 5 fun activities will keep them entertained all day long. 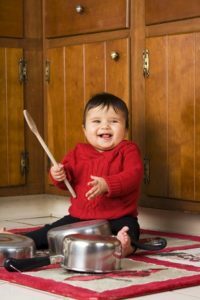 Helping baby’s development does not require playing with expensive or complex toys. Items you already have around the house make fun toys!